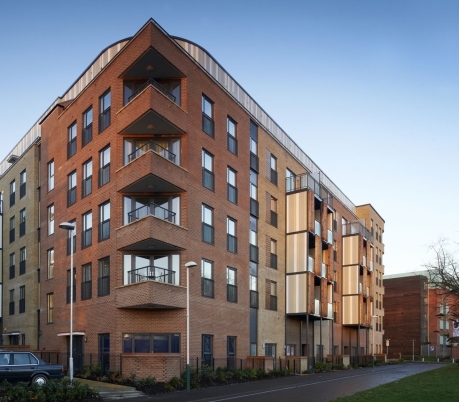 Built on the site of a former hospital in the centre of Romford, Reflections helped create an exciting new future for this redundant brownfield land with an apartment development which had a firm focus on sustainability. Reflections, a collection of contemporary urban apartments, breathed new life into Romford town centre by regenerating the disused former Old Church Hospital site and providing much-needed high-quality housing for the local community. By redeveloping this brownfield land, we created a new and sustainable use for a previously developed site, preventing it from becoming neglected and making a vital contribution towards the wider regeneration and future prosperity of the town. The Reflections development was designed with sustainability at its heart, with a variety of features being provided to reduce energy consumption and enhance green spaces in the midst of an urban area. All homes at Reflections are served by shared central heating from an on-site energy centre, which heats homes more efficiently than standard boilers and also reduces the environmental impact of the overall development. Apartments also feature ‘green roofs’ which aid insulation to the buildings while providing new opportunities for wildlife which would not have been possible on this previously developed site. Residents at Reflections also benefit from a large public park with outdoor gym and communal landscaped areas located throughout the development for the whole community to enjoy. The development has also played its part in reducing reliance on car ownership by participating in the Zipcar scheme, a car-sharing initiative which enables residents to access their own transport without the expense and inconvenience of running a vehicle. We have been committed to supporting the local community in a variety of ways as our Reflections development took shape. We were keen to provide employment opportunities for local people wherever possible, with an apprentice site manager and four trade apprentices employed on site. We also established successful relationships with schools and community groups in the local area. For example, we assisted Rascals, a local arts group for disabled people, by providing a donation to help volunteers to continue to provide their services. Meanwhile, a pupil at nearby Rush Green Junior School joined the Mayor of Havering to plant the first tree at the new Jubilee Park site after winning a Taylor Wimpey competition to choose its name.